In today’s fast-paced retail market, the role of electronic transactions is increasingly significant. Cash is no longer king regarding convenience, credit/debit cards, ACH, P2P (PayPal) and transactions via smartphone/mobile applications are the norm. Consumers not only expect but demand point of purchase transactions to be highly secure, speedy and available in remote or temporary locations such as concerts or carnivals. Billion M100 provides critical 24/7 internet connectivity and encrypted information transfer between stores and head office to prevent data loss and customer information leakage. Our multi-WAN solution (DSL and 3G/4G LTE) provide an always-on Internet connectivity supporting a seamless data and credit card transaction process regardless either the wireless or wired connection was unavailable, as well as VPN functionality to secure transaction data for geographically dispersed retail and chain stores throughout the country. Our solution can adapt with different IPs on both DSL and 3G/4G LTE network in various geography locations with strong signal strength. Given the challenge of providing seamless information transmission at different retail store locations, including both rural and suburban areas, Billion BiPAC 7820NZ, 7800NZ, and 8920NZ are embedded with DSL and 3G/4G LTE WAN interfaces, providing an outstanding fallback and failover functionality to enable disaster and data recovery. When the wired connection goes offline, Billion A/VDSL embedded 3G/4G LTE VPN routers will back up the Internet connectivity by switching to 3G/4G LTE WAN interface immediately to make sure the connection is always online. Billion A/VDSL embedded 3G/4G LTE VPN routers support multiple VPN protocols, allowing users to establish up to 16 VPN tunnels simultaneously between retail stores and head office in which all the data information will be encrypted and transferred safely. Dual-SIM 3G/4G LTE Embedded ADSL+ Wireless-N VPN Firewall Router. Reduce costs, increase revenue and improve business continuity. Advanced software delivers high reliability and secure connectivity between devices across a wide range of vertical market segments. 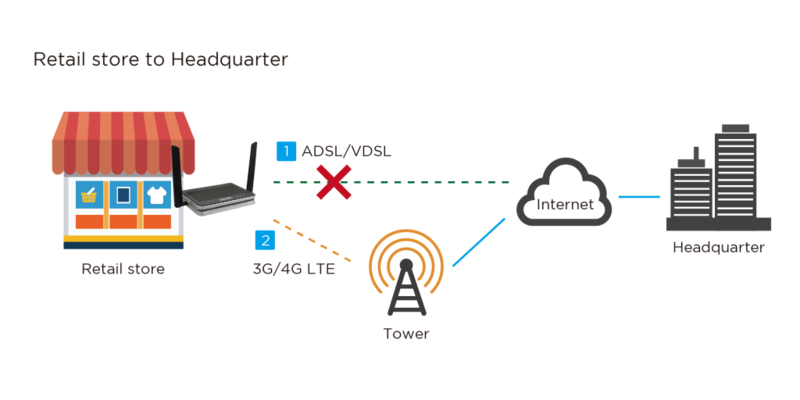 Uniquely embedded with the DSL and 3G/4G LTE WAN interfaces by connecting to 3G/4G LTE network quickly while the DSL connection (Main connection) fails.